One of the first things anyone looking for new speakers will consider is sound quality. Which speakers can produce the best sound? This is very important because music is central to any party, and therefore speakers which emit good sound are highly important. There are other qualities to consider aside from this, however, especially regarding party speakers. Party speakers are often lightweight and sometimes portable. If the speaker is portable it’s important that it has a good battery life so the music doesn’t die in the middle of the party. You may think that heavy speakers aren’t of very high quality, but technology is radically changing this—often light, small speakers can produce outstanding volume and quality sound. Tweeters emit higher sounds whereas woofers emit bass, and the particular quality of sound comes down to the size of the drivers. This is important to understand, but it is also fairly vital to have wireless or Bluetooth connectivity so that you can get the kind of music you want while at the party. It can be difficult weeding through the plethora of information out there especially when there are so many options; different speakers with different quality, functions, and prices. We have done all of this for you to find the best speakers for just about any party. Some of the best speakers for parties are the ION Audio Block Pary Live speakers. With Bluetooth connectivity, you can use your iPod, iPhone, iPad, smartphone, or Bluetooth-enabled tablet in order to listen to music. If you don’t happen to have Bluetooth you can still use the Aux input. 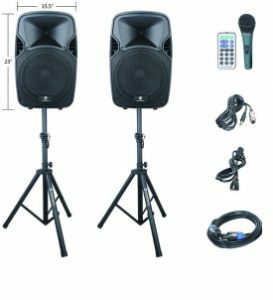 This is one of the best speakers for parties because it features a LED Light Dome which is built-in and has multiple modes. The ION Audio Block Party Live features a telescoping handle and wheels for easy portability, which makes these great portable party speakers. It also has a cabinet to keep the speakers secure. The display on the front panel is easy to use and clear, letting you view and adjust charge, Bluetooth, light modes, and volume. The ION Audio Block Party Live is battery powered. This PA system contains nine unique pieces. 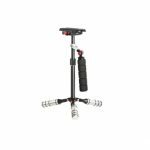 Aside from the passive speaker and active speaker, it consists of 2 speaker stands, a microphone cable, power cable, speaker cable, remote control, and microphone. It has FM radio as well as an SD card reader, USB, and Bluetooth capabilities. The PRORECK PARTY15 has a clear LCD display which displays the mode and other information. It has high-quality sound and 4 colors of LED lights built in for light shows. 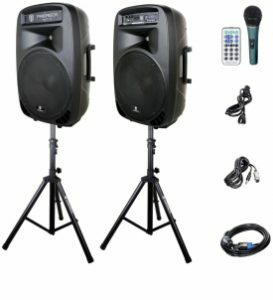 There are multiple connecting options including stereo RCA Line input, an unbalanced Mic, and the speaker output. It is easy to move thanks to the transport wheels so if you are looking for portable party speakers the Proreck Party 15 will work. The design of the ION Audio Party Time speaker is light, mobile, and convenient, making for a great choice for portable party speakers or even tailgate speakers. It can connect to Bluetooth devices and provides powerful sound for great music. It also includes a 1/8-inch aux input which can amplify the audio for your phone or computer. 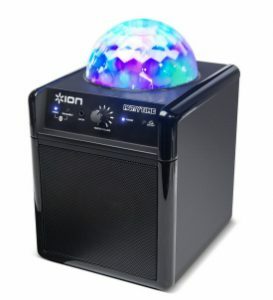 The main attraction about the ION Audio Party Time are the colorful lights which pulse with the music and change patterns, and this feature alone makes them remarkable house party speakers for just about any kind of party. Whether you are inside or outside this speaker has 360 degrees of amazing sound which make for great party speakers. The Big Blue Party Speaker features four built-in speakers which each emit sound at a different angle. It can be easily used outdoors because it is water-resistant and weatherproof, and it is also rechargeable with an AC adapter. The 75-watt speaker has incredible volume and a full-range stereo. The Big Blue Party Speaker has a passive radiator and subwoofer for rich bass. It’s mobile with an easy-grip handle. You can touch it to an NFC device for immediate pairing and also stream music from Bluetooth enabled devices. Connect this speaker system to any Bluetooth-enabled device, such as tablets, Androids, or smartphones. The Pyle PSUFM1035A Speaker System has an RCA Output which can be used to connect with passive speakers. The speaker system also has FM radio and an SD memory card reader. There are three flashing lights to amp up the excitement. It has a USB charging port for various devices and two ¼ microphone inputs. The display screen of the Pyle PSUFM1035A Speaker System features FM radio frequency, play time, and the number of songs. With high-power output and great quality sound you can listen to music as loud as you would like. 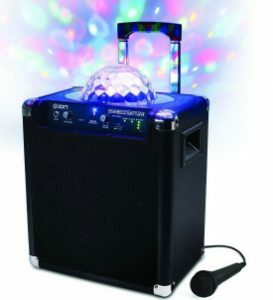 The ION Audio Party Rocker Live speaker struts a light show of four colors which pulsate with the beating of the music. The 50-watt speaker lets you view the volume and mode of your music with the LED display. With Bluetooth connectivity, you can sync up with other devices to listen to the music you love. Use Pandora or the playlist you’ve already created and you will see why these are such great house party speakers. The custom app gives you access to new features, and there are four lighting modes which are: Off, App, Beat Sync, and Auto. 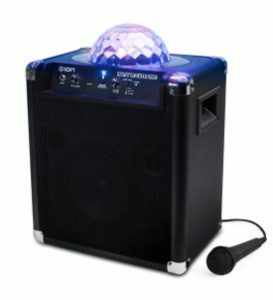 Having these various features including the lighting modes, LED display, and Bluetooth connectivity makes for the best party speakers. Enjoy reliable output, flexible input, quality audio, easy music controls, and great power with this speaker. 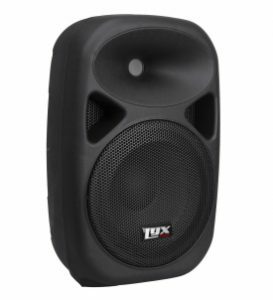 The LyxPro SPA-8 has a portable size and it is also lightweight for easy mobility, which makes it a good choice for tailgate speakers. The input options are in abundance, and they include RCA line inputs, R/L, balanced RCA jack, XLR jack, and a ¼-inch jack. Daisy chain to a separate active speaker thanks to the XLR line. The LyxPro SPA-8 – 8″ has a bass knob and treble knob so you can adjust the low and high frequencies to your preference. The setup is simple and doesn’t include heavy equipment, mixers, or power amps. It has 100 watts of powerful sound. Aside from all of this it has a USB port, SD card slot, and Bluetooth capabilities. This great speaker system has FM radio so you can listen to your favorite stations, as well as an SD card reader, USB, and Bluetooth capabilities. The PRORECK PARTY Speaker System has a 12” Woofer and a Titanium Diaphragm Compressor Driver that is 1.35”. The speaker system struts ¼” mic inputs for both unbalanced and balanced microphones and it also has XLR input. It has RCA Line Output and RCA Line Input. The Proreck Party Speaker System can connect to the passive speaker through the Speakon output. 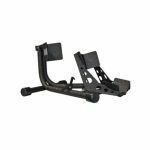 It is included with a remote control and Integrated speaker stand. There are two transport wheels so that you can transport the system easily. The 35-mm diameter speaker stand helps to allow for the great stereo experience. The Proreck Party Speaker System has a clear LCD display and overall high-performance sound quality. Alexa Voice Service lets you tap the microphone button and do almost anything, from ordering pizza to listening to the news or music. Aside from this, the speaker is Wi-Fi and Bluetooth enabled and provides rich sound that comes in a full-range. With Amazon Music you can search for music according to the date an album or song was released, or by lyrics. You can even opt to allow Alexa to choose the music. Aside from Amazon Music, you can stream TuneIn, Pandora, Spotify, iHeartRadio, and more over WiFi. If you don’t have WiFi you can use your mobile device as a hotspot. Amazon Tap Speaker has 360-degree omni-directional audio and dual stereo speakers. It is compact and only weighs about a pound so it’s very portable. The battery life can last about 9 hours and Alexa will warn you when the battery is getting low. When you consider all of these amazing features it isn’t surprising that people call the Amazon Tap Speaker one of the best party speakers. This Speaker sports a built-in microphone as well as Bluetooth compatibility. This means that you can connect to other Bluetooth compatible devices to stream your music. When it comes to party speakers it’s right in the name of the iDance Party Cube Boombox Speaker, so it makes sense it would be one of the best speakers for parties. It has a disco light which is music activated, giving the party a little more light and color. There are two vocal effects, which are Hi and Low. 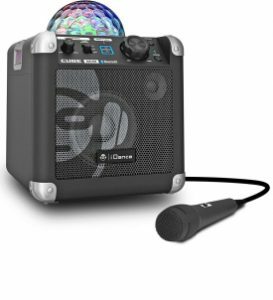 The iDance Party Cube Boombox Speaker also has guitar and mic inputs so you and your friends can even play your own instruments. It has a USB input which can be used for MP3 Playback, as well. It works great for a karaoke party, dance party, or pretty much any other type of party.